A testimony to simple ingredients making a simple yet rich tasting dish, this Dal Makhani uses just a handful of ingredients that come together in a very harmonious way to make you enjoy every spoonful of it. AJ has been traveling a lot this year, both for personal and work stuff and he was off to India for a few weeks earlier in January. Every time any of us go to India or have someone coming from India, I always have a ton of things I want to bring back from there. This time it was the turn of some cookbooks. I ordered a whole lot of cookbooks – all regional Indian cooking (The Dhabas of Amritsar, The Bangala Table, The Chettinad CookBook, Dastarkhwan-e-Awadh: The Cuisine of Awadh and many more) thorough Amazon India and AJ got it back for me. Even though I grew up in India and lived most of my life there, I have lived predominantly in the Southern part of the country and even though I have travelled to some Northern cities for work, my regret has always been that I haven’t really seen a large of India, especially the culinary aspect of it. I was however lucky during one such work trips to Rajasthan, to have enjoyed the dhaba experience. Dhabas are roadside eateries found along the highways, in Northern India. They are essentially truck stops and serve some of the most amazing food! One of the books that I asked Ajay to bring back for me is The Dhabas of Amritsar – it is a culinary journey through the various dhabas in Amritsar, a city in Punjab and recipes for the various dishes that each of these dhabas are known for. 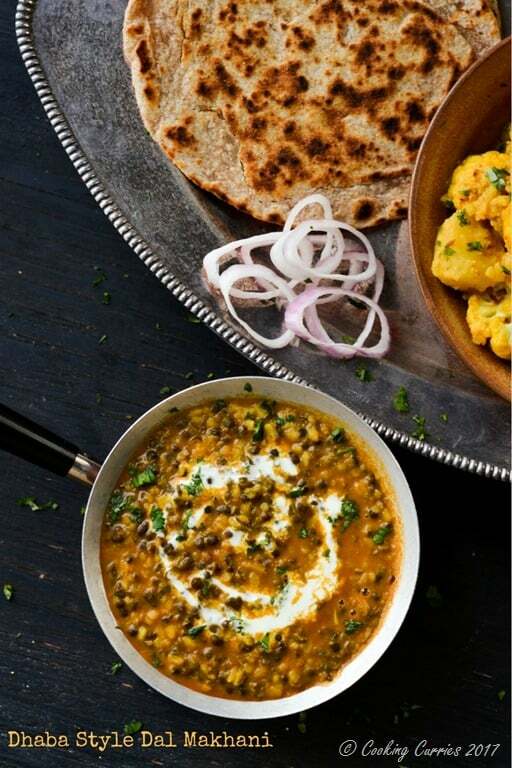 A lot of these curries are what we make at home – dal makhani, aloo gobhi, lassi, butter chicken, baingan bharta – but the dhaba style of making these is quite different and lends a completely different taste and flavor profile altogether. 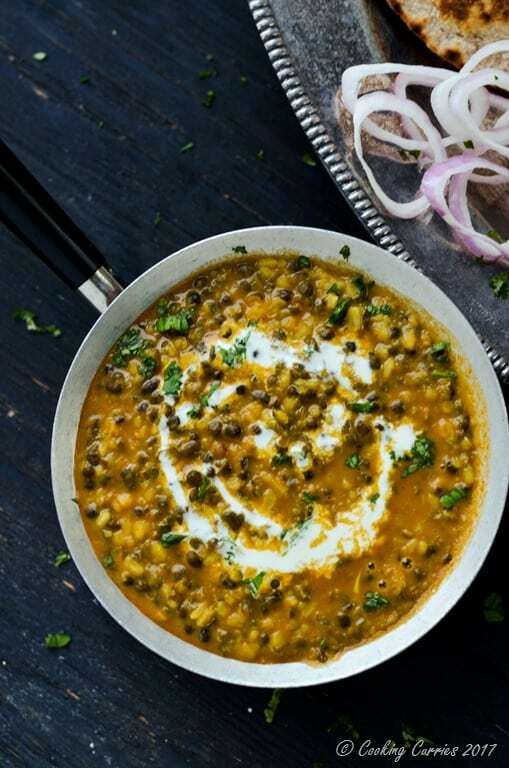 This recipe for Dhaba Style Dal Makhani is exactly that. This is quite different from how I make a regular dal makhani at home. 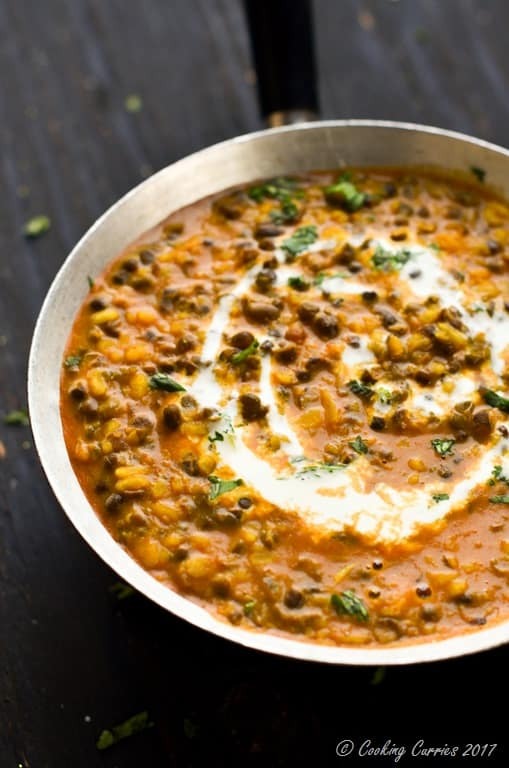 I love both the dal makhanis, but this has some level of heartiness to it that will make you feel like you are at a dhaba, dunking some hot Amritsari Kulchas into this Dal Makhani and finishing it off with some creamy Lassi. I have cut down the butter and cream in this recipe quite a bit and it is still pretty rich! If you want to make it EXACTLY like in the original recipe, double the quantity of butter and cream. Also, if you can manage to get your hands on The Dhabas of Amritsar, there are some really delicious, lip smacking and finger licking good recipes in there like the Chicken Masala Tikka, Moong Dal Halwa, Desi Chicken, Chole, Amritsari Kulcha and lot more! I am working my way through the book and already I am so very impressed by it. The recipe descriptions are a little different. It is definitely not for the beginner cook as they expect to know some methods and terms of cooking without describing them or getting much into detail. That is the single drawback I have found about this book, but otherwise it is such a treasure that will make you want pack your bags and jet off to Punjab to experience the dhaba culture first hand. 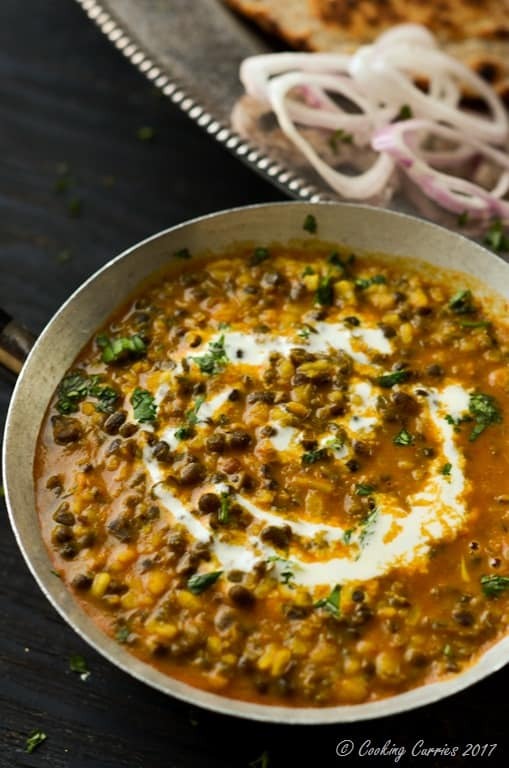 If you want to try a less time consuming dal to step into the Punjabi dal world, this Lahori Dal is a good place to start, so is the Dal Palak (Spinach Dal) or the simple Dal Fry which is also a video recipe. Soak the dal in water for 30 minutes or so. Drain the water and rinse the dal with fresh water a few times. Cook the dal with about 4-5 cups of water in a pressure cooker for 2-3 whistles / pressure releases. Lower the heat to medium low and let it stay in the pressure cooker in this heat for about 10 more minutes. Remove from heat and let the pressure release on its own, before you open the pressure cooker. Drain out the black water from the dal. Rinse the cooked dal one more time. Put it back to the pressure cooker and add the kashmiri chili powder( don’t be alarmed by the quantity, it is mostly for the color and less for the heat. ), garlic, ginger, butter, cream, tomato puree, turmeric powder and salt. Cook over medium heat for 15-20 mins. Mash the dal with the back of the ladle to mix it in well. Garnish with a little cream (optional) and fresh minced cilantro leaves. Squeeze the juice of half a lime and serve hot with parathas / kulchas / naans. I’ve never heard of Kashmiri Chilli Powder, is there a substitute I can use? Your instructions say that it is mostly for the color, so this leads me to believe that this Chili Powder is not spicy? Yes, this is not a spicy one. You can use about half the quantity of cayenne for this or even sweet paprika. Was wondering why do you drain the water from the dal? I thought the taste comes from that water. All other dals I don’t drain the water but for the urad dal with skin, the color of the water is a little off for me, too dark than what I like it to be. You can always not drain it, if that is what you want.